For those out of the loop when it comes to international basketball the US is currently in the quarter finals of the FIBA World Championships. The FIBA (which stands for International Basketball Federation) World Championships is similar to the World Cup except its for basketball rather than soccer. The FIBA World Championships is an international basketball event held every four years. The event is organized by FIBA and features competition between men's national basketball teams from countries around the world and is currently going on in Turkey. The FIBA World Championship is contested between 24 teams from the five FIBA regions of the world. During the preliminary rounds of the FIBA World Championship, teams are divided into four groups of six, and play a round-robin schedule with the other teams in their group. The top four teams from each group based on win-loss record advance to the round of 16, where the tournament moves into single-elimination mode. A consolation bracket is held for teams that lose in the quarterfinals to determine exact finishes from first through eighth place. When it comes to qualifying for the FIBA Championships there are a few ways in which a country can get in. First the host nation and the defending Olympic champion qualify for the FIBA World Championship automatically. Other teams have to play their way into the tournament via regional qualifying tournaments. In 2010, FIBA handed out automatic bids to the top six finishers at the FIBA Europe tournament, the top four finishers at the FIBA Americas Championship, the top three finishers at the FIBA Africa Championship, the top three at the FIBA Asia Championship and the top two at FIBA Oceania. In addition, FIBA handed out four wild-card berths. To be eligible for a wild-card berth, a team must have competed at its regional tournament and paid a wild-card fee. European basketball differs from the typical NBA game most Americans are used to watching. The game consists of four 10-minute quarters rather than the 12-minute quarters that the NBA uses. The court is actually 3½ feet shorter and six inches narrower than an NBA court. The paint is a trapezoid shape, rather than the rectangle of the NBA, and the 3-point line is between 18 and 39 inches closer to the basket, depending on where the shot is attempted, click here to see a depiction of the court during a recent USA international game. Instead of the six fouls an NBA player is permitted a player in a FIBA competition is disqualified after five fouls. 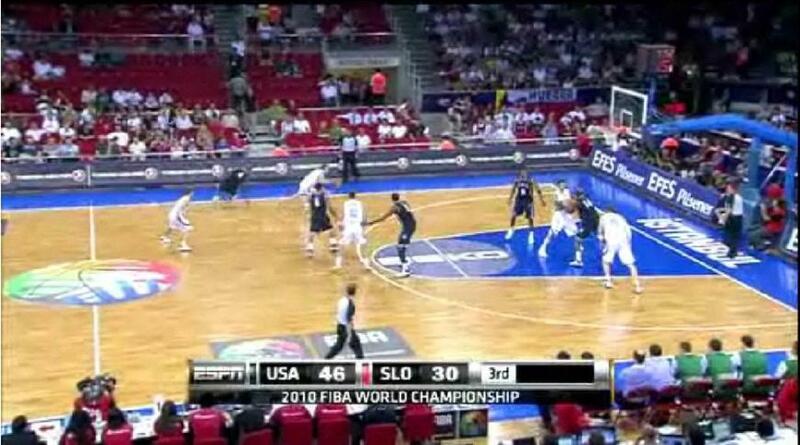 Also teams are allowed to play a full zone defense in FIBA games. So if you can tune to ESPN tomorrow, Thursday September 9th, at 11am to watch the USA face off against Russia in an international version of the Elite 8.